Objectives: To analyze short-term changes in peer affiliations, offending behavior and routine activities in order to evaluate three different processes: peer selection, peer socialization and situational peer influences. Methods: The short-term longitudinal TEENS study was conducted among a cohort of students from one mid-sized high school in Kentucky, as part of the larger Rural Substance Abuse and Violence Project. The study sample consists of one complete network of 155 ninth graders who completed surveys about their peer affiliations, routine activities and offending behaviors over the course of five waves of data collection during the beginning of the school year. The measurement intervals were no more than 2 weeks long. Longitudinal network analysis (SIENA software that enables actor-oriented stochastic modeling) was used to estimate peer selection, socialization, and situational effects. Results: Peer networks, offending, and routine activities appeared to be very volatile over the research period. Peer selection effects were found for structural network properties, demographics and delinquent values, but not for peer delinquency. 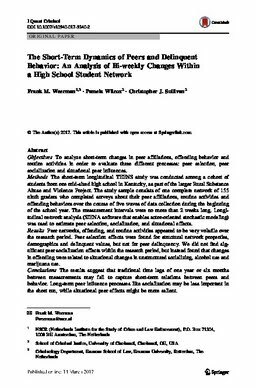 We did not find significant peer socialization effects within the research period, but instead found that changes in offending were related to situational changes in unstructured socializing, alcohol use and marijuana use. Conclusions: The results suggest that traditional time lags of one year or six months between measurements may fail to capture short-term relations between peers and behavior. Long-term peer influence processes like socialization may be less important in the short run, while situational peer effects might be more salient.